Do you ever find yourself searching for the factory specifications on your 1979-2016 Ford Mustang? We have all searched "mustang curb weight" once or twice in our quest to find the factory weight of our Mustang. Late Model Restoration is ready to answer any questions you may have regarding the factory specifications of your Ford Mustang SVO, Cobra, Mach 1, GT, V6, Ecoboost, GT500 and more! Whether you are looking for units sold, horsepower, fuel tank capacity, paint codes, torque, or more...We will cover it all!! What does "Factory Specifications" actually cover? 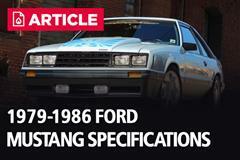 The beginning of the classic Fox Body Mustang started life in 1979 on the new Fox platform. This Fox platform was much more sleek than the previous Mustang II, but borrowed some of its look from European styling making it less like the traditional Mustang of the past. Ford shaved the extra weight making this Fox platform 200lbs lighter! Offering 4 engine options including the iconic 5.0L 302, 3 different body styles, and a few special edition models the combinations were endless! In 1987 Ford debuted its major redesign of the Fox Body Mustang. This redesigned Fox received aerodynamic headlights, and a smoother nose. Ford offered only two engine options during this Fox Body time period but made the change from speed density to Mass Air, changing the Mustang forever. The SVT Cobra and Cobra R also made its debut in 1993. Sadly, 1993 was the last year of the Fox Body Mustang! 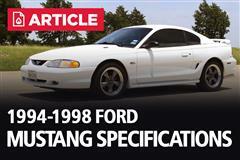 After much anticipation, in 1994 the new Sn95 Mustang body style was unveiled! This new Mustang Body Style included a running horse in the grille, side scoops ahead of the rear wheels and the beautiful long-hood/short-deck that we have all come to love. With the 1994-98 Mustang receiving an all new exterior ford felt it necessary to update the interior as well as the engine. Between 1994 & 1998 Ford debuted 3 new motors and a redesigned 5.0L. Ford also brought back the highly successful Cobra R in 1995 with an all new power plant! Ford unveiled a whole new edgy look in 1999-2004! This design featured sharper contours, larger wheel arches and more defined body lines that replaced the softer lines. 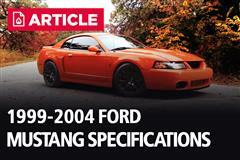 Ford upgraded the 4.6L SOHC and offered a new 4.6L DOHC Supercharged V8 in the all new 03-04 SVT Cobra. Ford also brought back the all new Mach 1, Bullit, the highly successful and newly redesigned Cobra R! These special edition models, engines, upgrades, and exterior styling changes helped shape the Mustang we have come to love to this day! Ford's design team developed an all-new platform, the first in 25 years, and created an all-new design full of retro aspects from the Mustang's past. Along with all these modern updates from Ford, they also released two new engines options. The new GT500 also made a comeback with a beastly 5.4L Supercharged V8 producing a whopping 500HP and 480ft./lb of torque. This 2005-2009 Mustang redesign was huge for the Mustang community! Ford brought many special editions to the new S197 platform. These included the V6 appearance package, Shelby GT-H, GT500 and much more. After the big redesign, the 2005-2009 S197 Mustangs began to revive the Mustang's popularity and helped revitalize the brand! 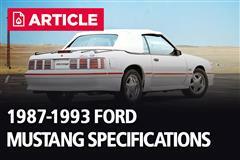 Ford made many changes during this new generation S197 Mustang's life. In 2010 they completely redesigned the exterior and interior, then redesigned the exterior once again in 2013-2014. 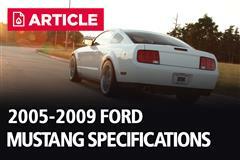 Although Ford decided to keep the 4.6L in 2010, but 2011 offered new light with the 5.0L Coyote V8 and 3.7 Cyclone V6. The same special editions carried over from 05-09, with the exception of the Bullitt. 2012-13 was the year of the BOSS 302 and 2013/14 GT500 helped you join the 200mph club! 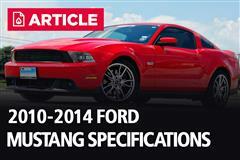 On June 20, 2014, the final S197 Mustang was built making way for the new S550 Mustang! When the S550 Mustang came out, we knew there were going to be some major changes. The new 6th generation Mustang made a statement when Ford released the 2.3L 4cyl Turbo that made over 300HP! Ford kept with the trend of the late S197 and added the 5.0L and 3.7L to their engine line up as well. Ford also ditched the live axle and joined the modern world with an aluminum IRS for improved handling on and off the track. 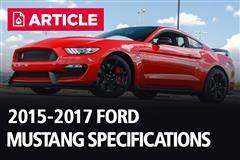 The 2015/16 Mustang also brought the S550 Shelby GT350 to life with an all new 5.2L flat-plane crank engine! This new Shelby GT350/GT350R was designed for the track with the driver in mind!